If you’re looking for an electric scooter to help with the morning commute, then the Glion Dolly is exactly that. It started life as a Kickstarter project that you can view here. An electric scooter, electric skateboard, electric bike or other forms of motorised personal transportation can cut your commute time drastically. 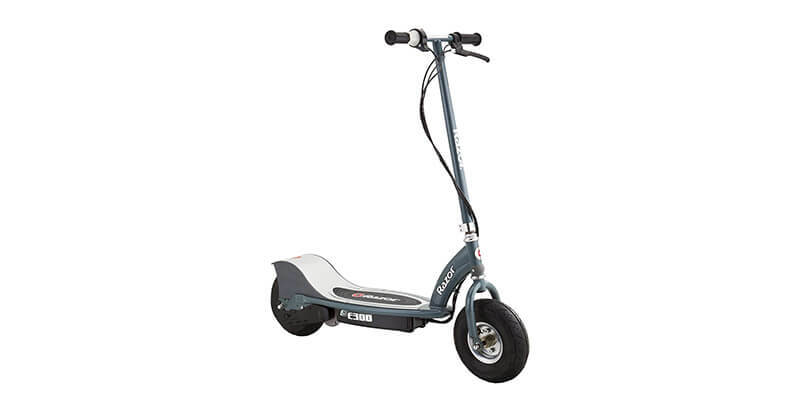 The Glion scooter was built with this in mind and is aimed at people that want to make the last mile or so of their commute as fast and painless as possible. Does it meet its goals and is it worth buying? 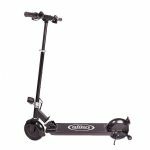 Read the rest of our Glion Dolly Electric Scooter Review to find out. 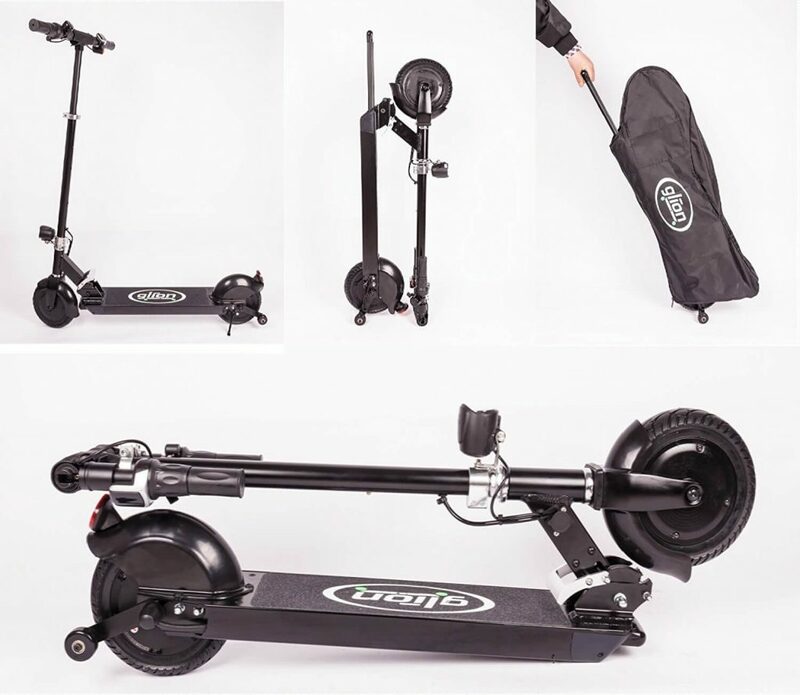 The Glion Dolly is a premium scooter designed specifically for the commuting market. It’s an electric stand up scooter that has the ability to be folded down and pulled along like a suitcase for easy commuting and storage. It’s well made and has some ingenious design features. It’s fun and easy to use, store and transport. Whilst there are some problems such as lack of suspension and slight range issues, overall, we think this is a great product that could transform your commute. 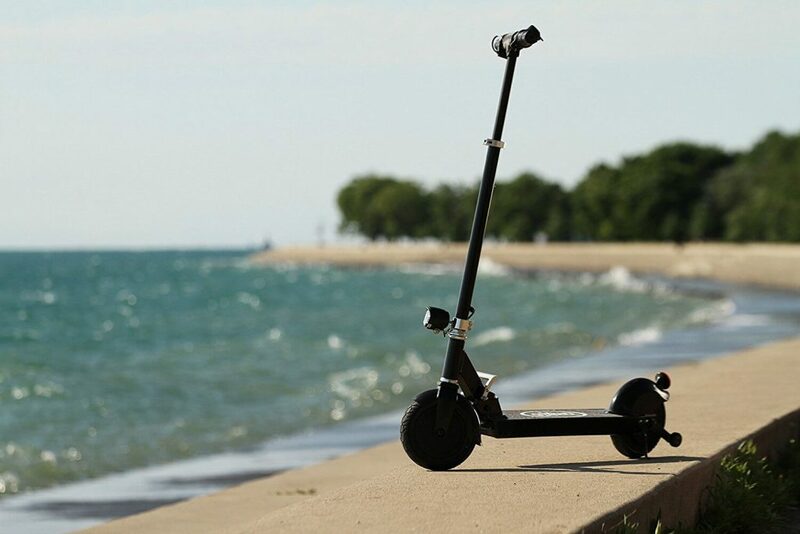 The main features of the Glion electric scooter is the ability to fold it super quick and roll it about like a suitcase, then stand it up for storage. 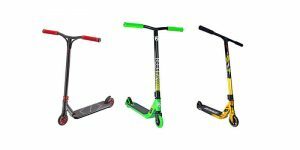 These are great features that work very well and we think are almost worth buying the Glion scooter for just in themselves seeing as the rest of the scooter is good. The Glion has a 250W DC brushless motor and an anti lock, maintenance free braking system. 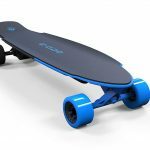 This is powered by a battery that can be charged in 3.25 hours and has a charge and discharge cycle rating of over 1000 times. This means the battery will last 3 to 5 years before it needs to be replaced. Glion also provide a replaceable battery so you can switch it out after it has done its 1000 cycles. The replacement process isn’t easy but it means you won’t have to buy a brand new scooter. It also includes a nice bright headlight and a built in tail reflector. It’s easy to switch on and will light up a dark street with no problems. The tail reflector is also a nice addition which is surprisingly rare to see on electric scooters. The Dolly has a tiny kick stand that is just about perfect. It does that job without ever getting in the way. It also has good sized, integrated fenders which almost completely stop any water being kicked up if you ride in the rain. 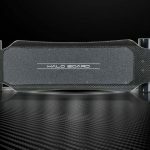 Let’s start with the unique parts of the Glion Dolly that are currently not included on any other scooter on the market. These are its ability to stand up vertically by itself and the trolley handle that come out of the deck so you can roll it around like a suitcase. 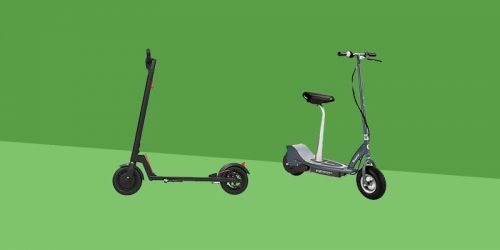 Both of these features are very simple but both are designed in such a way that they create a fairly major impact on the ease of use of the scooter as a whole. Being able to stand the Glion Dolly up vertically drastically reduces any stress when on a train or bus as you can stand it right next to you whilst taking up very little space. Then the ability to roll the Glion around will make carrying it a thing of the past. 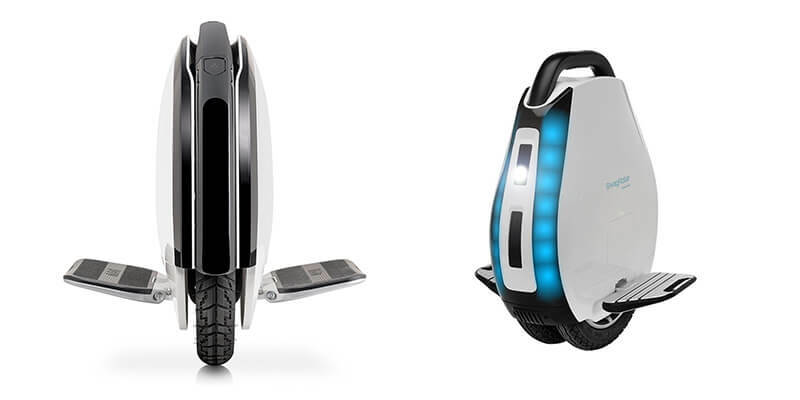 Both of these design features we love and think they are probably the best reason to buy one, they also both patented so unfortunately we don’t expect to see either feature appear on any other scooters in the future. Another great part of the design is the foot activated folding mechanism. This has got to be the fastest and easiest way to fold any scooter we’ve come across. All you have to do is unclip the handlebars, and put your foot on the latch to fold the main vertical frame. Simple. The deck is quite small, it’s enough for both feet but might be too small for one foot in front of the other. This can be good or bad depending on how you see it. It might make riding a little more uncomfortable but it does reduce the size and weight of the scooter which is what the Glion team were aiming for. The handlebars are also quite small. Again this will be a pro or con depending on your personal preference. It keeps everything compact and lightweight whilst also making it easy to weave around pedestrians and objects. However, there is very little room for mounting accessories and you get little choice for riding style. The Glion Dolly is very well made, it uses aircraft grade aluminum which has been powder coated to resist corrosion. 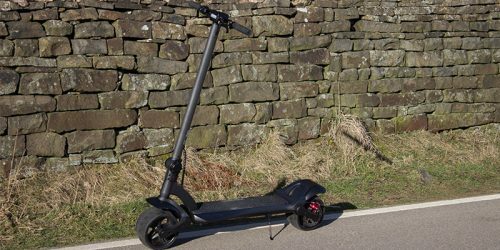 Whilst it isn’t the best looking scooter on the market, this does leave it with a decent finish and relatively low weight, at 27.3 lbs. We’re a little disappointed that the Glion doesn’t have a better information readout. The screen is literally just for the battery life and it isn’t always particularly accurate. It would have been nice to have a speedometer and better yet, an odometer to see how far you’ve travelled. 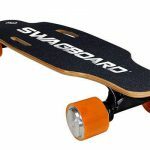 The 250W (which can peak at 600W) motor provides enough power to help it reach 15 mph, a top speed that might be a little disappointing to some. There are times where cyclists with foldable bikes will comfortable breeze past you. However, the acceleration is very smooth and relatively fast. The maximum range of the Glion said to be 15 miles. This is only really achievable if you weigh very little and are riding it on a perfectly smooth and flat surface. It also struggles with hill, like almost all electric scooters. Realistically we expect you to get between 7 and 10 miles on a single charge. Still pretty good if you’re expecting to be using it for commuting. Add in the 3.25 hour charge time and you shouldn’t ever have a problem with battery life. 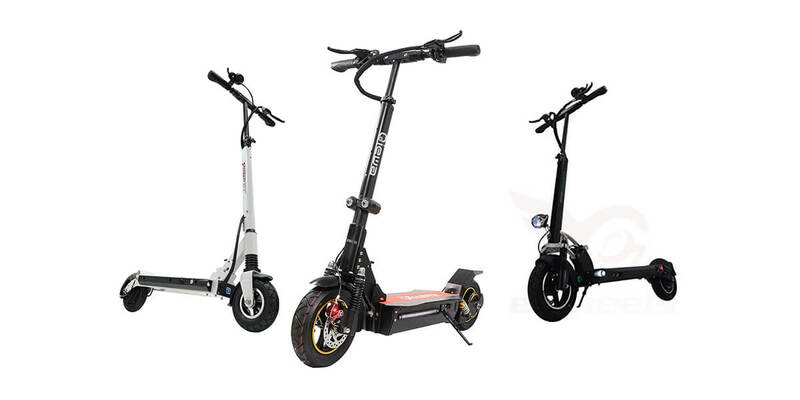 Unique Features – The folding mechanism, trolley feature and the ability to stand it up vertically are all fantastic and make transporting your e-scooter about as easy as it’ll ever get. The Battery – The battery is generally very good. The charge time and amount of charge/discharge cycles it can manage are some of the best we’ve seen. Also having the option to replace it when needed is a nice addition instead of having to buy another scooter. Also the charger is quite light at just 1.5 lbs. This makes taking it around with you even more inviting. 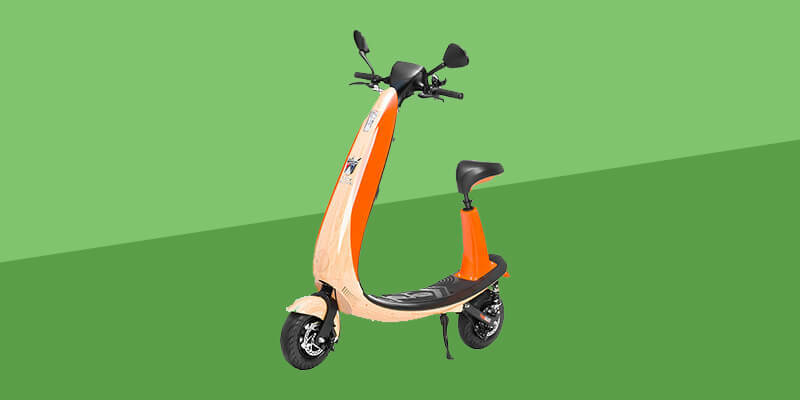 Nice Additional Features – The kickstand, fenders and the headlight are all some of the best we’ve seen and make using the Glion scooter a joy. The Throttle – The speed controls are ok, it’s a twist throttle and it feels a little cheap and clunky. There is also no cruise control so you have to continuously hold back the throttle to maintain speed. Not a huge problem but other scooters do it better. Top Speed – The top speed is a little low considering the price. Also it struggles up hills more than we would have expected. No Suspension – The honeycomb wheels just don’t do enough to make the ride as smooth as we would have liked. It isn’t bad but for this price could be better. 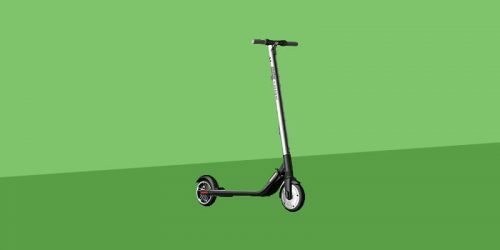 Overall, the Glion Dolly Electric Scooter is a fantastic mid range e-scooter that makes commuting a joy rather than a chore. It does have problems and isn’t anywhere near perfect but if you can live with these then you’ll be in for treat. For me, the pros massively outweigh the cons. I’d take a lightweight, super versatile and uniquely feature packed scooter over a comfort centric scooter for my commute. It’s not going to be comfortable anyway, so I may as well get it over and done with as quickly and painlessly as possible. For this reason I’d highly recommend the Glion Dolly, so much so that it also made it onto our list of the Best Electric Scooters for Commuting. For more information head on over to the Glion website. electric brake failed within 2 weeks. cheap metal for construction. flimsy handle bar. quick battery discharge. this sponsored review is not accurate. glad I returned mine and got my money back. not worth the price at all. Hi Christian, that’s unfortunate that you’ve had a bad experience with the Glion Dolly. We would make it very clear if we were doing a sponsored review, these were just our experiences and there was no compensation. 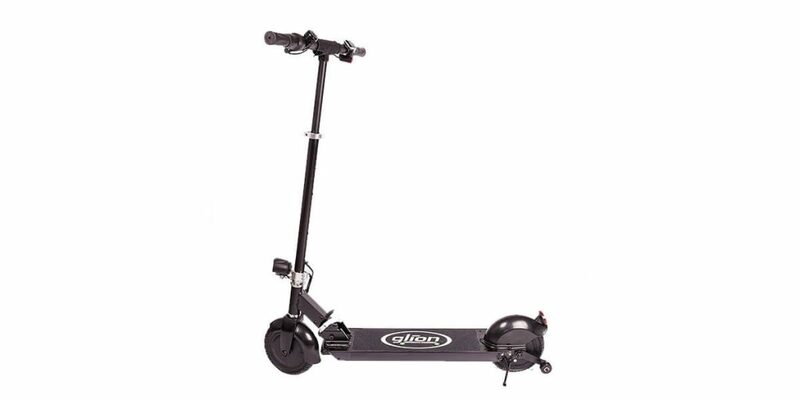 I own a Glion and it is a great scooter. Well made….electric brake is fantastic….takes some getting use to but definitely more dependable than mechanical brakes…. The electric battery meter is to be read when the scooter is stopped not while riding. The scooter is well thought out in every detail and the company from all reports is very responsive.